Detailed data model to manage the foreign exchange risk of a global treasury function. 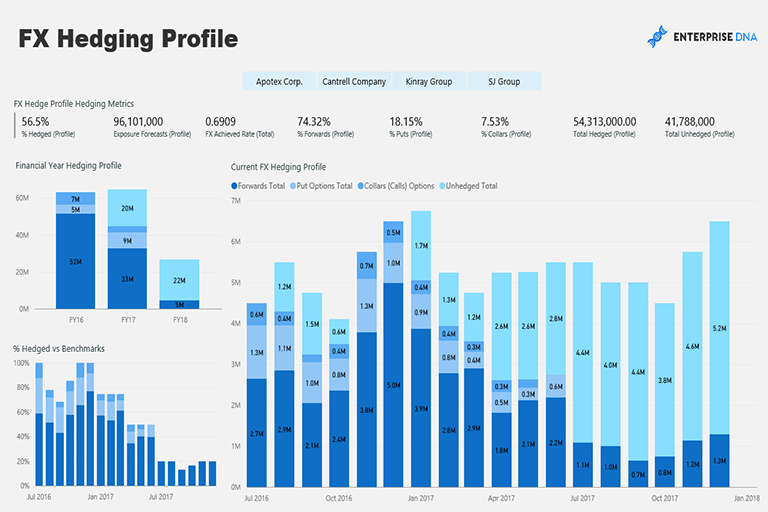 Analyse at the group level and drill down into the subsidiary level. Keep track of all trading in financial market products, including forward exchange contracts and currency options. Includes ability to; monitor hedging ratios versus set benchmarks, analyse achieved hedging rates through time and manage counterparty trading and credit risk. This is a detailed analytics solution that can bring new light to a complex financial function of global businesses. Can integrate into any generic global foreign exchange data set. FX Hedging Profile: Manage FX hedging for subsidiaries versus benchmarks. Benchmarks can be set at varying intervals, but always stay up to date with current hedging ratios and future hedging requirements. Be aware in real time of all risk management policy requirements. 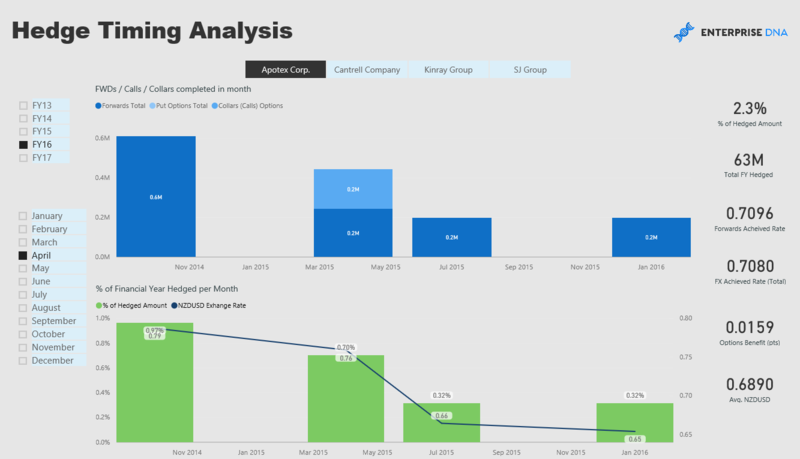 Hedging Analysis: Review all past hedging. When it was completed, who it was traded with and which dates were hedged during which time frames. Achieved Rate: Analyse the make up your organisations achieved FX hedging rate. Drill down into hedging rate for subsidiaries. Extremely important for accounting and reporting. Auditing requirements will require that organisations are across these metrics. Hedge Timing: Dive into the time frames hedging took place and the market data at the time of hedging. Important if you need to audit foreign exchange transaction during reporting cycles. Counterparty Analysis: Understand which counterparties your organisation is completing most of their trades with. Is it due to relationships, pricing, execution or any other reason? 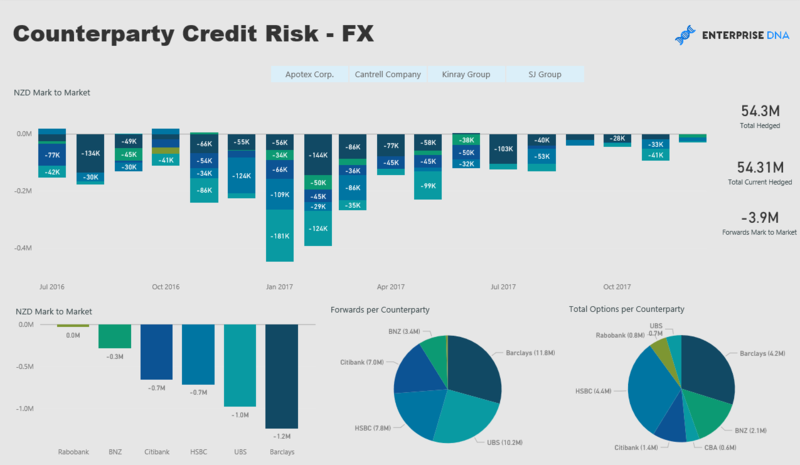 Credit Risk: Gain a full overview of the current credit risk that your company has with brokers and banks. In volatile financial markets gaining live updates into these calculations will assist executive decision making.